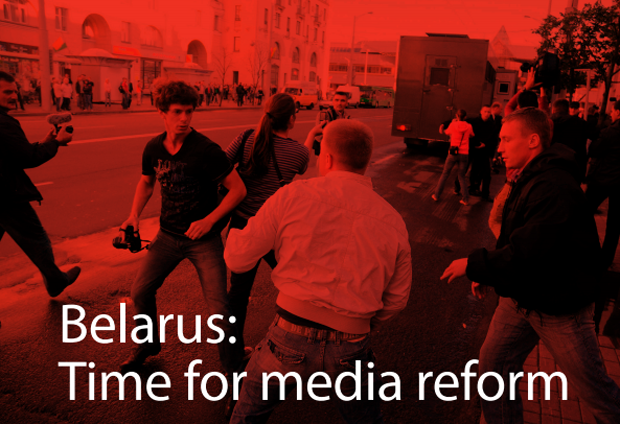 Read the full text of the policy paper “Belarus: Time for media reform” here. | Поўны тэкст аналітычнага дакладу “За рэформы медыя ў Беларусі” можна пабачыць тут. Join Index at a presentation of a new policy paper on media freedom in Belarus on 19 February, 2014, 15.00 at the Office for Democratic Belarus in Brussels. This article is the third of a series based on the Index on Censorship report Belarus: Time for media reform. Despite the constitutional guarantees and international obligations, Belarusian laws, by-laws and practices of their implementation seriously restrict the media freedom. The Law “On Mass Media” and practices of its implementation have negative effects on media diversity, including complicated procedure of compulsory registration of media outlets. The law can be used to push independent newspapers to the verge of being closed down. The procedure of accreditation and laws on state secrets are also used to restrict access to information. • the government of the country receives the right to regulate activities of “media that are distributed via internet”, although there is no definition of online media in the law. The compulsorily registration of the print media, which has a chilling effect of media freedom, is still used in Belarus. Article 13 of the media law provides for obligatory registration of any printed publication with a circulation of more than 299 copies. The registration process in Belarus has two stages; it is necessary to register an editorial board as a legal entity, and then to apply for registration of a media outlet. The law is arbitrary and presents a barrier to new entrants to the media market. In 2010-2012 the ministry of information issued 105 refusals to register new media outlets. “These are not draconian measures. We have the media law; we have always acted and will continue to act within the framework of this law,” commented Aleh Praliaskouski, the Minister of Information. Newspapers with a circulation of less than 300 copies are not obliged to register, but their activities are also regulated and controlled by the state. Each publication with a circulation of more than ten copies has to send at least five copies to state regulatory bodies according to “an obligatory mailing list.” Moreover, state bodies, first of all public prosecutors’ offices, demand such small-circulation publication to register as legal entities, thus obliging them to rent offices, pay taxes and employ editors according to the rules of the ministry of information. On several occasions the local prosecutors’ offices has issued warnings to publishers of such small-circulation media. These restrictions contradict the approach set out by the United Nations Human Rights Committee that stated that the requirements for the obligatory registration for small-circulation publications that are not issued on a regular basis is excessive; it has chilling effect of freedom of expression and it cannot be justified in a democratic society. Possibility of suspension and closure of media outlets is still a major problem despite changes in the law. The previous media law provided for a possibility to close down a media outlet by a court decision if the media violated Article 5 of the law at least twice within a year. Article 5 of the media law contained a list of ten particular violations that could lead to a court appeal against a media outlet. In the new Law “On Mass Media” this article is omitted, but this is not necessarily an improvement. On the contrary, Article 51 of the present media law allows for the closing down of any media outlet after any two (or, in some cases, even after one) warning, issued by the ministry of information or a prosecutor’s office, for any infringement, even a minor one. In 2010-2012 the ministry of information issued 180 official warnings to mass media; two of them, Narodnaya Volia and Nasha Niva, were on the verge of being closed down. The ministry withdrew its claims, but the legal framework that allows closing media outlets down is still in place. In 2011 the ministry of information appealed to the supreme economic court with a legal claim to close down two leading independent newspapers Narodnaya Volia and Nasha Niva. Narodnaya Volia received four official warnings before the appeal. The last one was issued for an article called “Goebbels-TV is on air” and was a critique of a highly sensationalist documentary broadcast by state television about events after the presidential election of 19 December 2010 in Minsk that accused the opposition of organising mass riots. The newspapers appealed against the warnings and a court examination of their cases was postponed. While it was on hold, on 6 July 2011 the ministry of information issued one more warning to each of the two newspapers stating that Nasha Niva did not publish its subscription index in a single issue and that Narodnaya Volia had printed the wrong number of issues. In July 2011 the Ministry of Information withdrew its court appeals to close the newspapers down. The decision to withdraw the appeal was arguably due to the significant public response to the case, including reactions from the international community. It is worth mentioning, that Narodnaya Volia and Nasha Niva were the two independent newspapers that were returned to the state press distribution systems in 2008; at that time it had been presented as a step forward by the authorities of Belarus in order to normalise their relations with the EU. Despite the court appeals against the newspapers being withdrawn, each of the publication was fined 14 m roubles (about £1,800) for violation of Article 22.9 of the administrative code (“violation of the media legislation by a mass media outlet iteratively within a year after a previous written warning”). While online media in Belarus are able to operate relatively freely, the authorities of the country reiterate their commitment to introduce tougher regulation for information websites to duplicate restrictions media face offline. It already resulted in restricting the access to several independent news websites that are included in an official black list. Articles 11 and 17 of the media law provide for the registration of “mass media that are distributed via the internet global computer network” while giving space for the council of ministers to develop particular regulations. At the same time, the law provides no definition of online media. No governmental decree on the regulation of online media has ever been actually published, despite the law being in force for five years. The current definition in the law allows the government to in theory consider many different types of websites as “mass media that are distributed via the internet global computer network”; including corporate websites that publish updates and personal blogs. Presidential decree No. 60 (On the Measures to Improve the Use of the National Segment of the Internet Network), signed on 1 February 2010, marked a new set of challenges to online free speech. • “lists of limited access” of websites are introduced; the sites on the list are banned from access from computers at state bodies, educational institutions, public libraries, etc. Governmental regulation of online media may be introduced in the near future. According to Belarus’s deputy information minister Dzmitry Shedko, “the most influential Belarusian websites may be given the mass media status.” The Deputy Minister stated in November 2013 a working group had been set up to address this issue. The ministry is taking a restrictive approach to regulation of online media. Only representatives of government agencies have been included in the working group. The deputy minister has argued the regulations are a necessity to make “the most popular and influential websites accountable for distributing any kind of information”, including a possibility of revocation of registration for breaking the regulations. Independent media experts have noted that the proposals will not create additional opportunities for the journalists of online publications. In line with the practice of the current law, the regulation seems to be intended to introduce additional responsibilities for online media outlets to restrict their coverage in a similar manner to that of the printed press. The authorities of the country have been quite reluctant to discuss or implement recommendations on reforms of media-related legislation. Nor have there been changes to the implementation of the law to bring the practices of public bodies in line with international standards. In particular, the country’s officials have stated they do not recognise the mandate of the UN Special Rapporteur on the Situation of Human Rights in Belarus, Miklós Haraszti, and will not cooperate with him. Still, the analysis presented in this policy paper shows the overall developments in the media field are no more positive than a few years ago. The authorities of Belarus show little sign of wishing to discuss reforms of the media field with civil society. Attempts by the Belarusian Association of Journalists to apply to the standing commission on human rights, national relations and mass media of the house of representatives of the national assembly to hold an open and public discussion on media-related laws and their implementation in Belarus were rejected. As was BAJ’s proposal to the national parliament to discuss reform of the media law with international experts, in particular the OSCE. Index on Censorship approached the ministry of information of Belarus in October and November 2013 to discuss media reform. The ministry did not reply to a request for a meeting in Minsk. The ministry responded in a letter with Shedko, deputy minister, stating that the ministry “conducts systematic analysis and monitoring” of implementation of media-related legislation in the country; it also “considers suggestions of citizens and legal entities on these issues” and “initiates amendments in the media law, when necessary” though gave no specific examples of this. In January 2014 Usevalad Yancheuski, the head of the principle ideological department of the presidential administration, informed BAJ that the ministry of information “is requested to invite representatives of journalistic organisations” to be involved in the work on possible amendements to the media law, but it has led to no particular steps so far. There are various ways in which access to information for journalists is restricted in Belarus. The main two of them are the accreditation of journalists and the use of secrecy laws. The procedure of accreditation is understood by state bodies as a permission they are entitled to grant – or to reject – to a journalist for receiving official information from them. Additional barriers to access to information are created by the laws on state secrets and state service. These laws contain vague and broad definitions of data that can be declared a state secret. More than 60 different state bodies and institutions have the right to attribute certain information to be a state secret; the list of organisations includes the ministry of information, the ministry of culture, the ministry of education, the National State Television and Radio Company and regional authorities. Loosely-defined provisions in these laws allow for the restriction of access to information of public interest by labelling certain data as a “state secret”. Criminal defamation is chilling to freedom of expression. A prison sentence may lose a journalist their job, while a criminal record may make them unemployable in the future. Belarus continues to criminalise defamation, even though the UN special rapporteur on freedom of expression has called for its decriminalisation. Six articles of the Criminal Code provide for criminal liability for libel and defamation, while offering additional protection to state officials, including the president of the country. These articles have been used against journalists. In July 2011 the journalist Andrzej Poczobut received a three-year suspended jail sentence for libelling the president. A year later he faced similar charges again. The journalist spent ten days in detention in June 2012. In 2013 the new criminal case against him was cancelled and all charges were dismissed. A criminal case against the journalist Mikalay Petrushenka was initiated in 2012. He was charged with insult of a state official; his article for Nash-dom.info website allegedly contained “public insult” of a deputy head of Orsha local authority. Linguistic experts who analysed the text found no insulting words or expressions there; the case was dropped in October 2012. Belarusian law provides not only for criminal, but also administrative and civil liability for defamation. It can be noted as a positive development that in recent years there have been no administrative or civil libel cases against media or journalists were initiated by Belarusian officials. Anti-extremist legislation has been used in Belarus to curtail media freedom. The current law “On Counteraction to Extremism” came into force in 2007. It contains vague and ambiguous definitions of terms “extremism” and “extremist materials” that allow for its arbitrary implementation. On 10 January 2011 the ministry of information cancelled the broadcasting license of Avtoradio for distribution of information that the ministry considered “public appeals for extremist activity” after the authorities broadcast an election appeal by opposition candidate Andrei Sannikov during the 2010 presidential elections. The appeal contained the phrase “the fate of the country is determined not in a kitchen, but on the square” a phrase the authorities deemed as an appeal to extremism. All attempts of Avtoradio to appeal against the decision were unsuccessful. In October 2012 the authorities started a full-scale tax inspection of ARCHE magazine. The department of financial investigations blocked bank accounts of the magazine, thus making its further issuing impossible. In two pieces shown by state television Valery Bulhakau, the editor of ARCHE, was in fact accused of “dissemination of extremist literature”. That slander campaign forced Bulhakau to temporarily leave the country. Later the case was dropped. Forty-one copies of Belarus Press Photo album were confiscated on 12 November 2012 by Belarusian customs officers on the border between Belarus and Lithuania. The KGB, state security committee, appealed to court with a request to consider the album to be “extremist material”. According to the KGB, the photos “reflect only negative aspects of life of the Belarusian people with authors’ personal insinuations” and thus they “humiliate citizens of Belarus” and “belittle the authority of the state power.” The publication that contained the best press photos by Belarusian photo reporters was considered extremist by Ashmiany District court on 18 April 2013; all the confiscated copies of the album were destroyed. In September 2013 the ministry of information cancelled the publishing license of Lohvinau Publishing House which was the publisher of Belarus Press Photo album. The publisher appealed against the decision, but in November 2013 the supreme economic court of Belarus upheld the decision by the mnistry of information to cancel the licence of the Lohvinau Publishing House. Other laws are also used to persecute journalists for their legitimate professional activities. In August 2012 Anton Suriapin, a journalism student, was charged with assisting an illegal crossing of the Belarusian border. He had posted photos on his blog of teddy bears dropped by parachute over Belarus by a Swedish PR firm to protest over the lack of media freedom in the country. He was arrested and detained by the KGB for more than a month, but later released. On 29 June 2013 the KGB announced that a criminal case against Anton Suriapin was dropped, and he was cleared of all charges. Recent years have seen no improvements of the media-related legislation in Belarus, despite continuous calls for reforms from civil society of the country and international community. The media law remains restrictive; it fails to foster the development of pluralistic and independent news media through a complicated procedure of compulsory registration of new media outlets and possibilities for the state to close down existing media even for minor infringements. The authorities clearly look into expanding the restrictive regulation to online news media, while access to some independent websites is already restricted in Belarus. The procedures of journalists’ accreditation and laws on state secrets are used to restrict access to information. Criminal defamation and anti-extremist laws are used to curtail free speech. Despite the recent talks between Belarus’s Foreign Ministry and the Office of the OSCE Representative on Freedom of the Media, the authorities of the country remain reluctant even to discuss any possible legal reforms of the media field with civil society. • a possibility of extrajudicial closing down of media should be eliminated; the Ministry of Information should not have the authority to impose sanctions on media, including initiating of cases of closure of media outlets. Equal and full access to information should be ensured for all journalists of both online and offline media. The institute of accreditation should not be used to restrict the right to access information. In particular, the existing ban for cooperation with foreign media without an accreditation should be lifted as it contradicts the Constitution of Belarus and its international commitments in the field of freedom of expression. Several provisions of the presidential Decree No 60 of 1 February 2010 on regulating the internet should be dropped in line with the recommendations in “Belarus: Pulling the Plug“, along with various other edicts related to the implementation of the decree. In particular, owners of websites should be free to register them at any domain and host them in any country. News websites should not be black-listed and blocked.